How to Sew Pants that are Handmade With a Professional Look! Sewing pants can be challenging. This article will provide you with the info on how to sew pants with a professional look. If you are like me and have school aged kids, you are working on cranking out some clothes before school starts. And if your kid is like mine and has grown six inches in a year, pants are on that list. Not pajama pants, or lounge pants, or even sweat pants. I’m talking real pants. Jeans, trousers, and khakis with pockets and maybe even a zipper and button or snap! 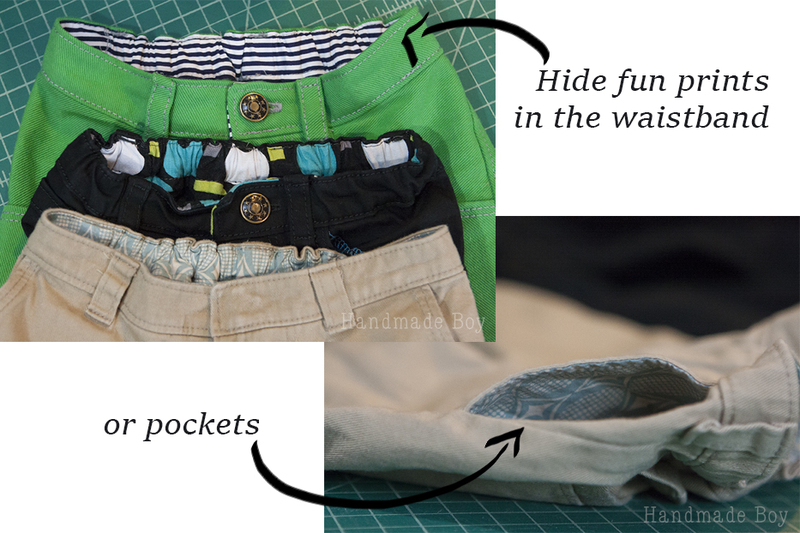 This article provides you all the tips and tricks on how to sew pants that look store bought! Now, I know a lot of people are afraid to sew pants for older kids because they may not look professional, or worse, you’re afraid they may look home made from 1985. Well, I’m going to give you some tips and tricks for how to sew pants that are both professional looking and also hand made! 1. Start with a great pattern. My go tos are the Classic Chinos, Skinny Jeans and Castaway Cargos. 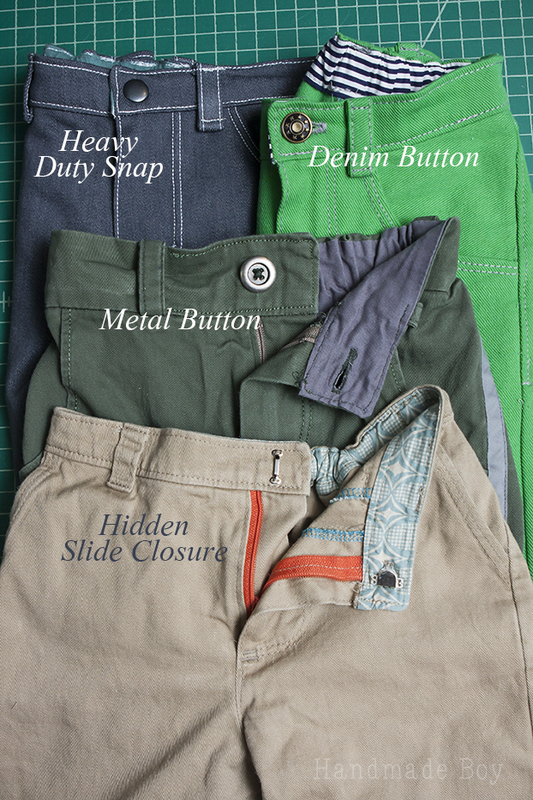 Look for details like pockets, topstitching and hardware to help make your pants look professional. 2. Fabric choice is very important in keeping your school ager’s pants professional looking. Yes, novelty prints are darling and fun and they do have their place, but this is not the time to pull out the quilter’s cotton. Stick with sturdy fabrics. These are often referred to as bottom weight fabric. Cotton twill is my favorite. Duck cloth is also nice and gets softer with each wash and wear. 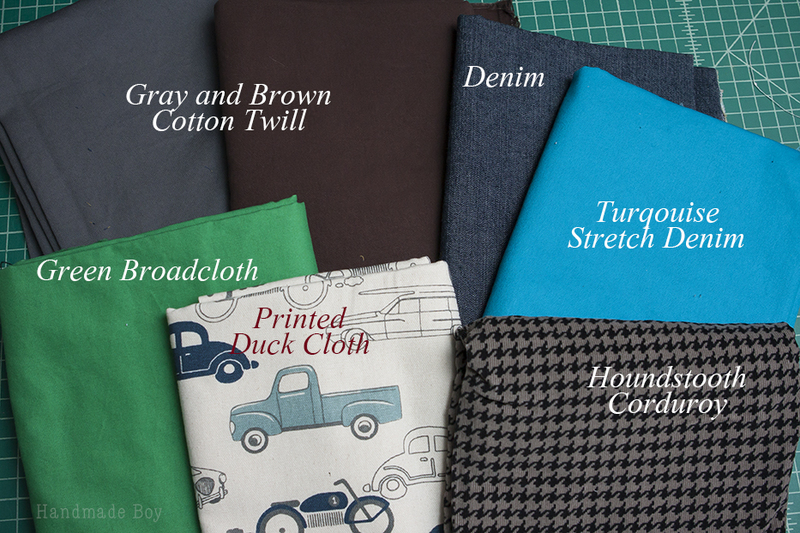 Chino, poplin and broadcloth are often available in a variety of colors. And there is always classic denim and corduroy. Check out www.peekaboofabricshop.com for some great choices. 3. Choose the proper hardware. I know there are tons of fun plastic buttons in pretty colors and shapes, but for a more polished look, stick with what you would be more likely to find on ready to wear (store bought) clothes. A heavy duty snap, denim snap or slide closure is easier for younger children. A traditional denim or metal button all have a nice finishing touch for kids who are comfortable with buttons. 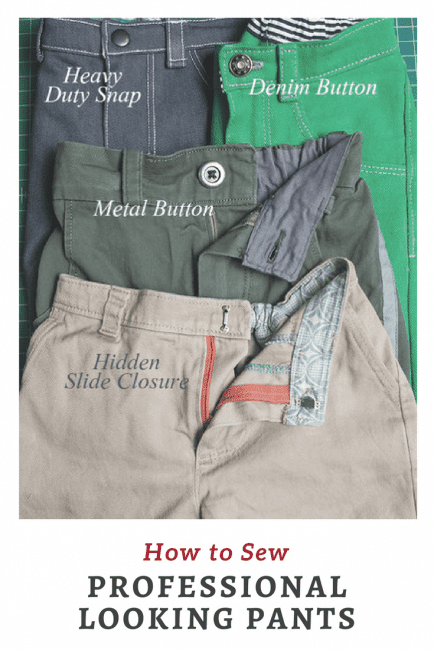 The hidden slide is also nice for dressier pants like chinos or slacks. And while we are looking at the waist band, interface that puppy! Even if the pattern doesn’t call for it, go ahead and do it. You won’t regret it! I like to use SF 101. It gives the fabric nice stability, but doesn’t make it stiff. 4. Topstitching. For great pants, it’s everything. Think about it, what is the one thing that every pair of store bought pants has? Fabulous topstitching!! Now, it doesn’t have to be contrasting. It can match your fabric and still add a beautiful amount of detailing to your pants. 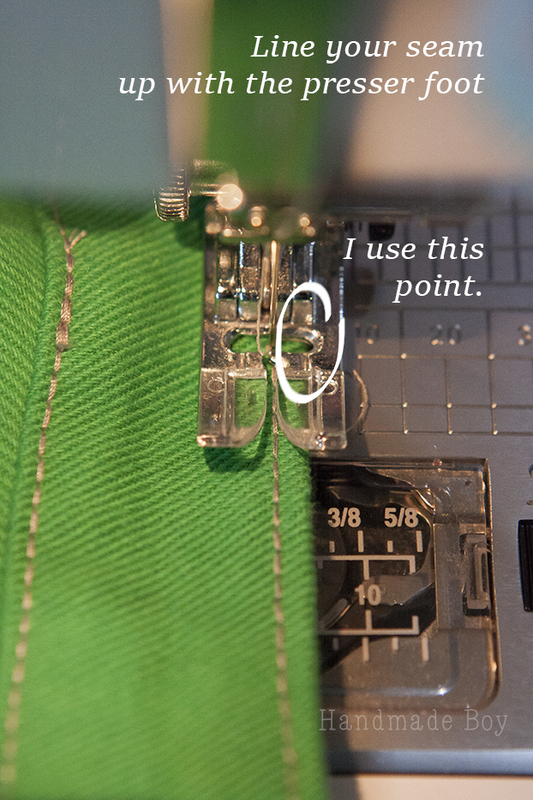 There are a few keys to great topstitching. Lengthen the stitch length. I like anything between a 3.6-4 on my machine. Stitch style. Straight stitch. A great choice is also the triple stitch. It makes a nice thick stitch that doesn’t get lost in the fabric. Consider a double needle. It’s not a must. But it does add a lot of something wow, especially to jeans. I prefer a wider double (twin) needle and use a 4.0. Topstitching thread or cotton thread. Both of these are slightly thicker than the polyester thread you use to construct your pants with. Yes, you have to switch your thread, but it can really be worth it. 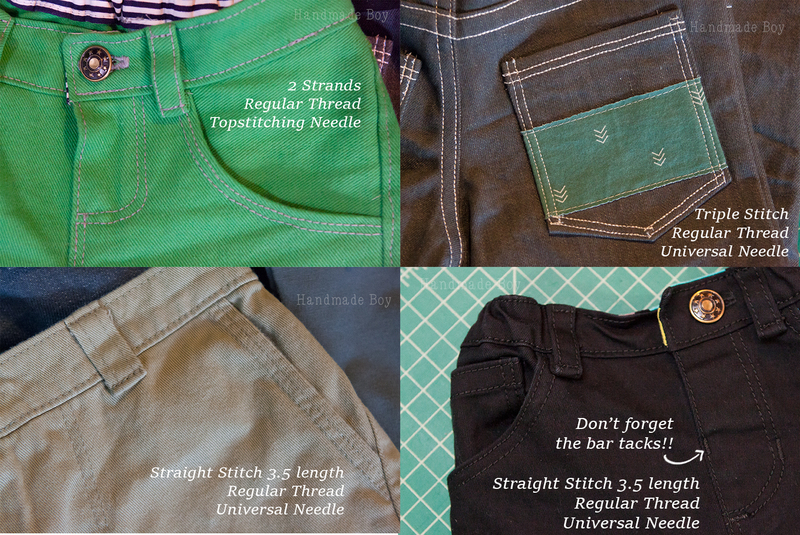 You may not be able to use the triple stitch if you use cotton or topstitching thread. But that’s okay, because it will stand out on it’s own with a regular straight stitch. You may also have to use a topstitching needle with either of these threads. Just depends on the machine. 2 strands of thread. If you don’t have the color of topstitching thread you want, thread 2 strands of thread through your machine to achieve the same look. Don’t watch the needle! Line the seam up with a mark on the presser foot and watch that to keep it lined up. I use the inside of the presser foot. Go slow and steady. It isn’t a race. Are you still wanting to break into your stash of novelty fabrics? You can!! It’s great for hidden secret details. I love to use fun fabric for the waistband lining, or the pocket bags. Or show a bit of it off and add a small bit to the back pockets for some fun! Like in one of the pictures above. There you have it – now you know how to sew pants with a professional look! My little tips and tricks for sewing professional looking pants. Be sure to share what you create over on the Peek-a-Boo facebook page. Hey, very good job with these pants, they look amazing ! Like Sarah Helen said, your kids must be proud with these 🙂 . I already own the classic chinos pattern, that I used last year for wedding outfits for my boys, but now I’m looking for less “formal” outfits. Which pattern did you use for the green pants ? They look fantastic ! I think I know, but what do you mean “Triple Stitch”? Great info. I have made myself pants with a zip fly but I’m afraid to for my kids because I worry they will be too rough on the zipper and break it. Do you use haevy duty Ippers or do just regular ones hold up OK? I use regular zippers. My son is 5 and hasn’t damaged one yet. So far so good!